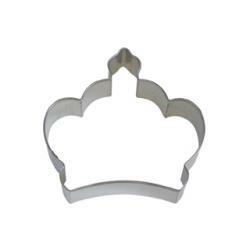 Creating a Princess cake has never been easier with this tiara 2 piece cutter set by FMM Sugarcraft. Two tiara's are included in this set, the larger one works great as a cake topper but can also be used to decorate the sides of a cake to create a delicate lace effect. The small cutter is ideal for decorating cupcakes to accompnay the main celebration cake. For PDF tutorial on the FMM Princess Tiara, click HERE.